Go Under Ground and Discover the Gem of the Union. Located in the Lower Level of the UWM Student Union, the Gasthaus is the perfect place to relax with a meal, a beverage and a friend. For over 40 years students have enjoyed our pub classics. From our Appetizers, Burgers, Salads and Pizzas you are sure to find something on our menu to satisfy your hunger and thirst. With our 420 sq feet of HD projection screen tvs, 8 monitors and 10 DirecTV receivers, the Gasthaus is a great place to watch your favorite sports team. Many students of all ages find the atmosphere at The Gasthaus conducive to study especially in groups. You may even see an occasional class conducted by one of the "Cool Professors." 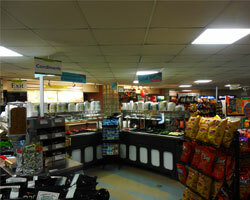 With a focus on speed and convenience, The Union Station brings its customers a wide variety of meals and snacks. Located on the ground floor of the Student Union building, we are open seven days a week. 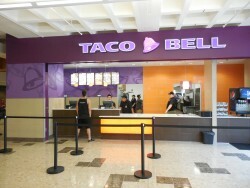 The Hot Food line provides a wide variety of options for breakfast and lunch including fresh pasta and quesadillas. We serve fresh sushi and Asian dished made-to-order as well as delectable fresh juices and smoothies. The Union Station features a fresh soup and salad bar with a large selection of Mediterranean items, as well as a selection of hot freshly made sandwiches including burgers, chicken, fish and veggie-burgers which can all be completed with toppings at our condiment bar (this means you can always find the quick lunch you’re looking for). Our grab n’ go cooler is stocked with pre-made ciabatta sandwiches, wraps, sushi a variety of salads, and more. The Union Station carries a selection of vegetarian, vegan, and gluten free options, both freshly made and in our grocery line. If you’re looking for a quick snack or refreshing beverage we carry over 250 different snack items such as candy, chips and cookies; we also carry over 175 different canned and bottled beverages. Any time of day, The Union Station has the products you need. Stop in for a fresh donut or bagel for breakfast, and then come and check out our daily lunch special. Whether you’re in need of an ice cream bar, iced coffee, energy drink, or it’s lunch time and you’re looking for a filling hot meal, you can find it all at The Union Station! 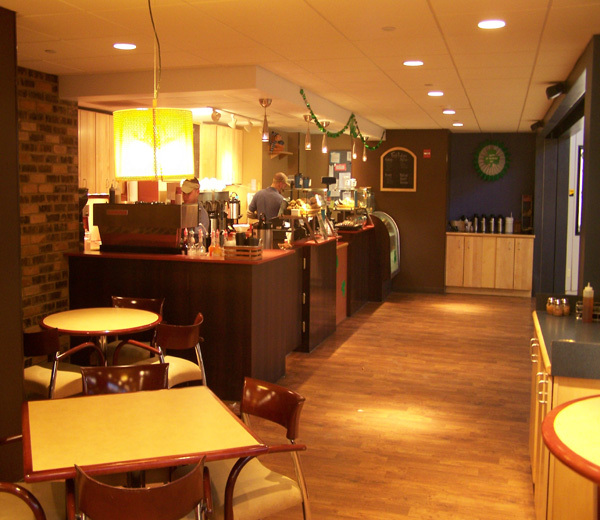 This highly accessible Grind at the Student Union is a popular Grind choice for students and faculty. Located in the first floor of the Student Union, this Grind has plenty of seating and works as a great study area or a place to meet up with friends. Perfect for a quick cup of coffee on the way to class or sit and study. The UW-Milwaukee Grinds serve coffee roasted locally in Milwaukee, which means your latte or cappuccino is crafted from beans that have met rigorous quality and flavor standards. If you are not a huge coffee fan, this Grind also serves premium hot tea, iced tea, chai beverages, lemonade and Italian Sodas. Grab a quick cookie or muffin to go with your beverage. Our scratch-baked goodies are brought in daily from a local bakery that prides itself in using only real ingredients. Don’t forget to bring in your own mug — The Grind staff will give you a discount on whatever drink you want in it! 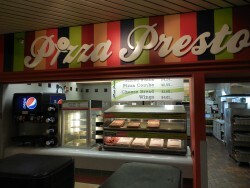 At Pizza Presto, we offer a variety of self-serve pizza, wonton-wrapped mozzarella sticks, and fresh-baked cheese bread throughout the day. Students have their choice of pepperoni, sausage, cheese, margherita, or weekly special pizzas served hot and fresh, making the Pizza station a great choice for anyone on the go! City Subs offers nothing but the freshest and finest sandwich ingredients. Create your own sub, croissant, ciabatta, or Panini sandwich and load on the meat or pile on the veggies. Go right ahead and customize your perfect sandwich or choose one of our delicious signature sandwiches! Round up chips and a soft drink, cause we’re making it a combo! The Flour Shop is an excellent choice for anytime of the day. Breakfast is served from 7:00am to 10:30am and includes biscuit sandwiches, hash browns, french toast sticks, a wide variety of beverage choices, and fresh fruit. 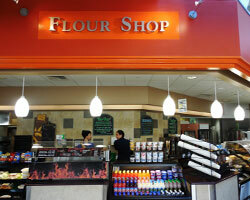 The Flour Shop also offers some of your favorite fresh bakery goods like donuts, muffins, brownies, bagels and cookies. 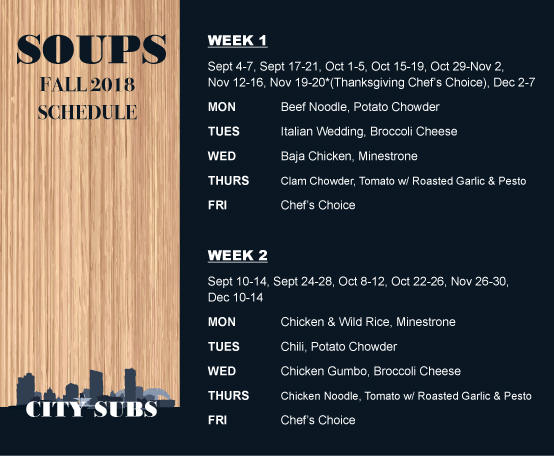 For students on the run, quick meal alternatives like salads,empanadas, pizza puffs, wraps and specialty food items are available throughout the day. “Creamier is Better” It’s proof that all the little ice cream making secrets that Cedar Crest practices are paying off! So whether it’s a malt, shake or just a double scoop on a waffle cone, Cedar Crest is there for you with the rich creamy flavor you know and love. 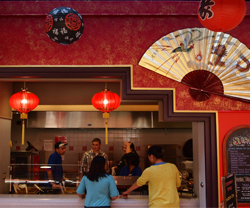 Stir Fry is a fast, casual, asian stir fry where you control your destiny. Create your own Asian stir fry from our selection of fresh vegetables, Asian-inspired sauces and meats. Whether you’re in the mood for oriental, vegan, something with a little kick or just plain hungry, Pacific Wraps is sure to satisfy all of the above with a variety of unique creations wrapped up in a flour tortilla. All our our tasty wraps are ready to go when you are. We also have boneless chicken, eggrolls, crab rangoon, and falafel available all day. With great service and a friendly attitude, we serve up your favorites made fast and fresh. Our energetic staff works hard to provide both students and faculty with an overall great dining experience that keeps Taco Bell a campus favorite and coming back for more! 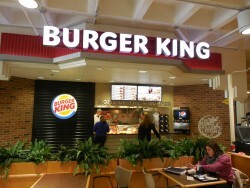 Our Burger King provides fresh all American classics, as well as new creations that customers have come to expect of a Burger King experience. Offering all the standards from hamburgers and cheeseburgers, to veggie burgers and chicken tenders. Students can always count on a fresh hot meal from our campus Burger King.